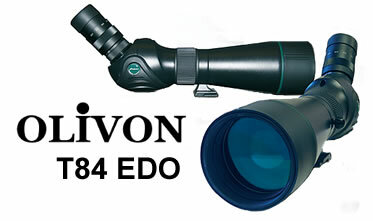 Olivon T84 EDO 20-60x84 Spotting Scope is a serious piece of optical equipment, designed for people who are serious about their hobby and want the best optics available. In terms of optical quality, it is comparable with any of the high-end spotting scopes from the top brands on the market - delivering outstanding colour rendition, image detail and excellent low light level performance. High resolution optics and full multi-coating of the lens produces clear, colour correct images so important for Bird watching. This version features twin element ED (Ohara S-FPL53 extra low dispersion) glass which reduces chromatic aberrations resulting sharper detail and colour correct appearance at the edges of objects. 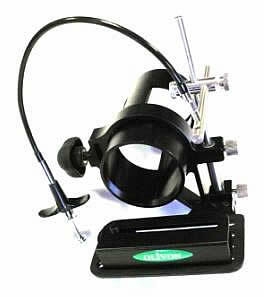 The large magnification range offered makes it ideal for viewing scenery or long range observation. 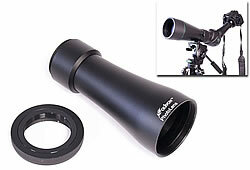 Suitable for star gazing and astronomy with it's large 84mm front lens which is excellent for light gathering. Designed specifically for the outdoors the T-84EDO is fully waterproof with a Nitrogen filled body. This means that when transferring from wet conditions or extremes in temperature the optics will not fog internally. In keeping with it's high spec design the T84EDO also features drop off coating. This makes it perfect for bird watching as it can be used straight from its case with no fear of fogging. The eye-cup twists down and is removable, which when removed and replaced with an adaptor ring will accept the Olivon UDCA camera adaptor. Fully multi coated optics. Waterproof and fogproof construction with a nitrogen filled, rubber armoured body. 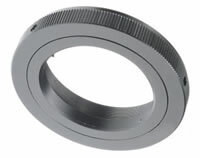 Easily adjustable focus ring. 10 year guarantee.  High quality angled spotting scope. Objective lens diameter: 84mm. ED (extra low dispersion) glass for ultra sharp and bright viewing. Front objective has drop off coating. Eyepiece magnification: 20-60x zoom. Eyepiece: 8-24mm. Eyecup: twist eyepiece cup. Comes with stay on case. Objective focus length: 480mm. Fully multi coated optics. Waterproof and fogproof construction. Rubber armoured body. Nitrogen filled. The Universal Digital Camera Adapter from Olivon slots over your spotting scope eyepiece and is secured by a tightening screw. 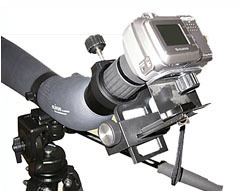 You can then attach your digital compact camera via the tripod socket. Then simply invest a few minutes of your time to alter the horizontal, vertical and depth settings to suit your digital camera model so that it is aligned with your spotting scope eyepiece and your ready to digisope - it really is that simple. This adapter ring is required to fit the Olivon T84 to the Olivon UDCA. This high end adapter connects the Olivon T84 EDo using advance optics.